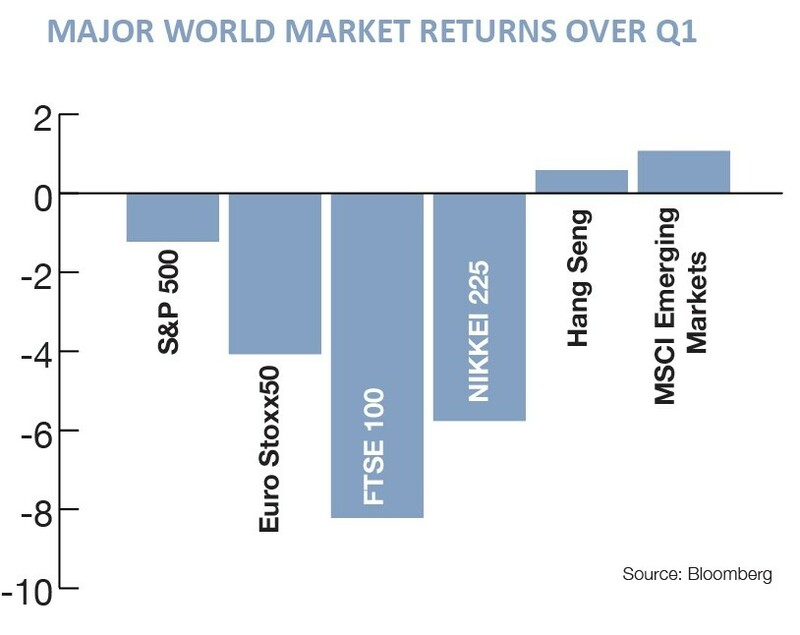 Investors reared on the quiet calm and steady gains of equity markets over the past few years were given a reminder of that old adage ‘investments can go down as well as up’ as stock markets globally took a turn for the worse over the first quarter of 2018. Bottom of the class was the FTSE 100, which – in dropping 9% – took the mantle as the worst performing major market. We’re told that it was the decline of technology related stocks that acted as the dead weight on markets, but it’s hard to reconcile that with a UK market showing little in the way of hi-tech representation. We must therefore look elsewhere for answers. is perhaps unsurprising to see the UK indices lagging against a backdrop where thorny issues such as the Irish border and future trade deals remain far from resolved. Add in the implications of a ‘meaningful vote’ (whatever that means) on the final deal and the remote prospect of a business unfriendly Labour government, it’s a wonder FTSE didn’t sink to double-digit declines. Collectively, the UK spends more abroad than foreigners spend in the UK. While that’s most notable in the trade deficit, even when the trade in services and returns on investments held abroad are taken into account, the UK still managed to spend £83bn more abroad than foreigners spent in the UK. Coming hard on the heels of the £114bn deficit we racked up in 2016, it’s clear to see that demand for foreign goods and services is so insatiable that the only way to keep paying off our tab is to resort to the sale of assets instead. For example, that might be the sale of our football clubs, vast swathes of the West End, properties that lay dormant or, more mundanely, UK Government debt. While US president Donald Trump would have us believe that a substantial current account deficit puts a nation in a strong negotiating position as the ‘customer’, the flip-side of the coin is, without the generosity of foreigners to keep on extending credit to us in this way, we will either need to reduce the quantity of things we consume or accept tougher conditions on the deal. Those tougher conditions could come in many forms. 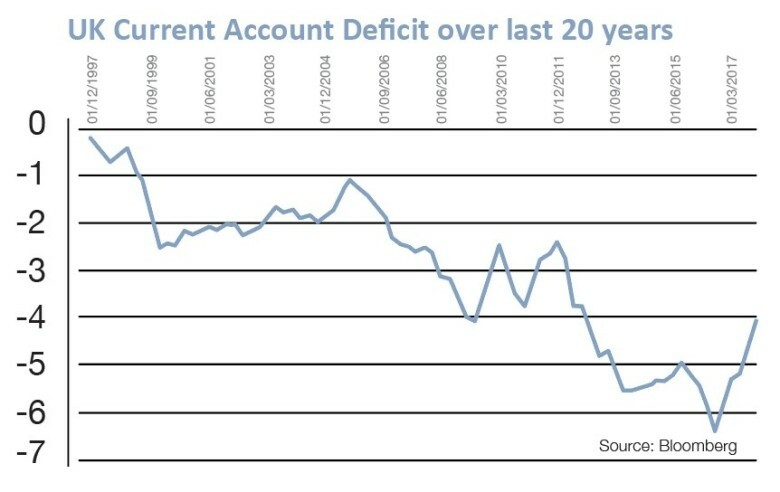 If foreign investors decided not to buy UK Government debt, interest rates would need to head higher still, hurting the economy in the process. Worse still, if this triggered the sale of their existing positions (which now exceed £300bn); the Treasury could find itself short of cash potentially enforcing further austerity. If that were not a worrying enough prospect, think of the impact a foreign withdrawal would have on the value of the pound. Short of the £83bn or so of foreign investment required to balance the books, sterling would undoubtedly plummet in scenes reminiscent of the immediate aftermath of the Brexit vote. Requiring the nation to work harder just to stand still, any goods that remain imported would rise in price, whilst those that transferred to UK production would serve only to put pressure on an already stretched jobs market. What’s the result? Unquestionably higher inflation, which in turn would create the need for…yes, you guessed it, higher interest rates. And so, as Brexit approaches and the various camps likely increase their hostilities in the pursuit of a final deal, it would pay investors to remember that we live in a global world, with global values and reliance upon each other which would have been previously inconceivable. This interdependency has helped forge a prolonged period of peace and a FTSE 100 index where over 80% of earnings are generated on foreign shores. 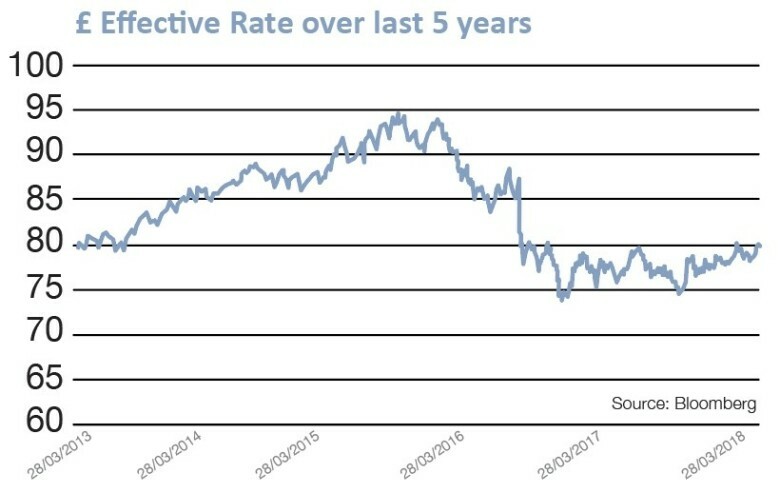 With this in mind, the decline in the FTSE now seem overdone, but for global investors, the message sent by Brexit may keep them waiting in the wings for now.